​Each year in July, since 2011, biologists from the Pennsylvania Natural Heritage Program (PNHP) have participated in a global citizen science project for National Moth Week. This year, their participation led to an important new discovery in southwestern Pennsylvania! In late July, PNHP staff were testing a new light set up to attract moths to prepare for a program and survey. While they were viewing and photographing moths attracted to the light station at an Allegheny County woodlot, they noticed an unfamiliar-looking dagger moth, so named for black, dagger-like wing markings. 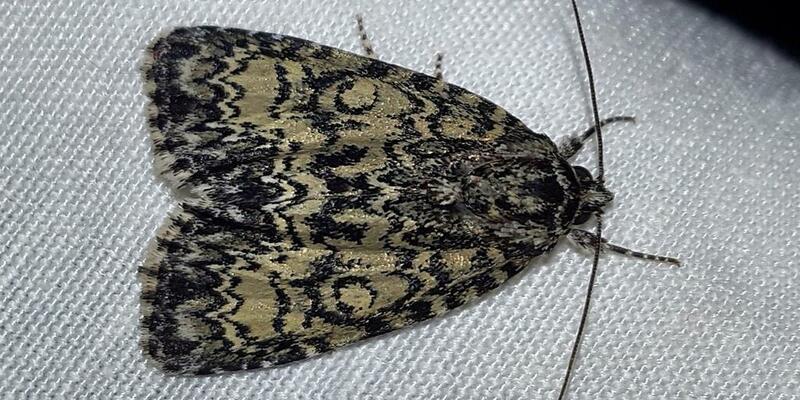 After further study and consulting with experts, they confirmed a new moth species for Pennsylvania, Heitzman’s dagger moth (Acronicta heitzmani). Heitzman’s dagger moth is a rare species known from the Midwest U.S., first collected in Missouri in 1964. The moth appears to occur in oak-hickory forest and woodlands, as was the case in Allegheny County. On the same night, a Heitzman’s dagger moth also was documented at a National Moth Week event at Raccoon Creek State Park in Beaver County. Why was this species only discovered now? Why were the first occurrences on the same night? What host plants support this species? Is its range expanding, or is the species just very rare or difficult to detect? Moths are among the most diverse and successful organisms on earth. Scientists estimate there are 150,000 to more than 500,000 moth species. Most moths are nocturnal, and need to be sought at night to be seen -- others fly like butterflies during the day. After dark, moths and bats take over the night shift for pollination. Nocturnal flowers with pale or white flowers heavy with fragrance attract these pollinating insects. National Moth Week celebrates the beauty, life cycles, and habitats of moths. “Moth-ers” of all ages and abilities are encouraged to learn about, observe, and document moths in their backyards, parks, and neighborhoods. Organizers encourage participation by registering an event. The week in 2019 will be July 20-28. National Moth Week offers everyone, everywhere a unique opportunity to become a citizen scientist and contribute scientific data about moths. Citizen science involves people taking part in the collection of information that helps increase scientific knowledge. Pennsylvania state parks offer a number of opportunities throughout the year for the public to participate in citizen science. The next upcoming opportunity will be Operation Feeder Watch listed on the DCNR Calendar of Events. DCNR is a partner in the Pennsylvania Natural Heritage Program, which conducts inventories and collects data on the commonwealth’s biological diversity. This article was adapted from a Wild Heritage News article by David Yeany, Conservation Planning Specialist & Ornithologist, Pennsylvania Natural Heritage Program, Western Pennsylvania Conservancy. To stay in touch with the work of the program, sign up for their newsletter.